Environmental awareness has never been a strong suit of the Russian natural resource industry. However, wasteful and destructive timber harvest practices may have become even more prevalent in the Russian Far East today than they were during the Soviet era. 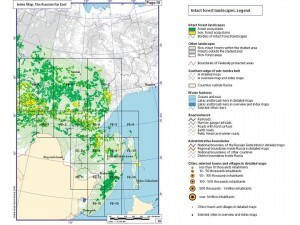 As discussed in my previous post, the Russian government has been implementing a series of economic measures – including a gradual increase in export duties on round-wood and direct subsidies for timber processing capabilities in Russia – the goal of which is to shift timber exports from unprocessed to processed wood. But what is the environmental impact of such measures? Do they help protect Russia’s only renewable strategic resource? Or do they further the ongoing devastation of Siberian forests? Ironically, the economic policies of the last five years have both positive and negative effect on the ecological situation in Far Eastern forests. Whether negative or positive effects will ultimately prevail in the long run remains to be seen. One obvious economic effect of increased export taxes and subsidies for local processors is the enhanced domestic demand for timber in the Russian Far East itself, owing to the fact that domestically processed wood is now cheaper than Chinese imports. As the newly opened mills consume a growing volume of harvested round-wood, more trees must be chopped. But the problems concern not only the sheer amount of wood that is cut, but also where and what exactly is being harvested. The increased pressure for quantity (and quality) of timber harvested means that the operations are increasingly pushed into areas previously untouched by the industry, leading to a gradual fragmentation of taiga forests and a destruction of their unique ecosystems. Today, the romantic notion of the Russian forest as an unbroken band of boundless wilderness is a myth. In reality, the taiga consists of fragments of wilderness, separated by areas affected – directly or indirectly – by modern land use. Industrial forest harvesting and the fires that often follow logging, along with road construction, are the main causes of fragmentation and transformation in the southern parts of Siberia and the Russian Far East. In the northern parts of Eastern Siberia, the extraction of mineral resources, including prospecting and the construction of transportation infrastructure, as well as the massive human-induced fires that accompany these activities, have also led to forest fragmentation. 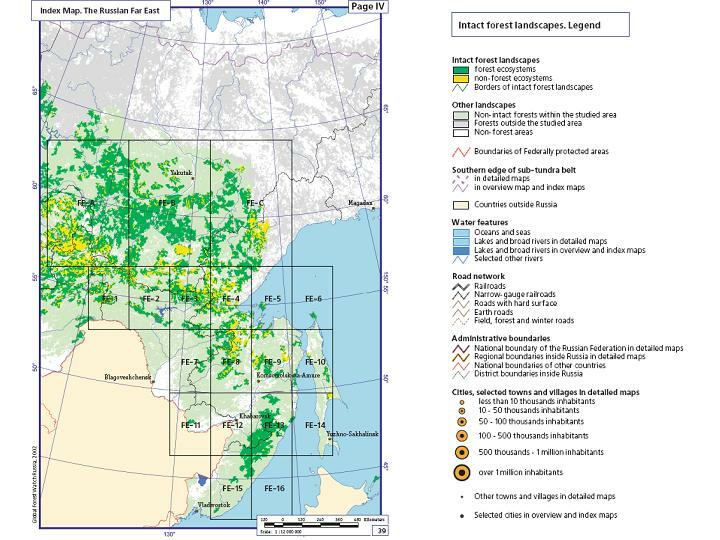 As a result, less than 40% of the forest zone remains intact in Eastern Siberia. 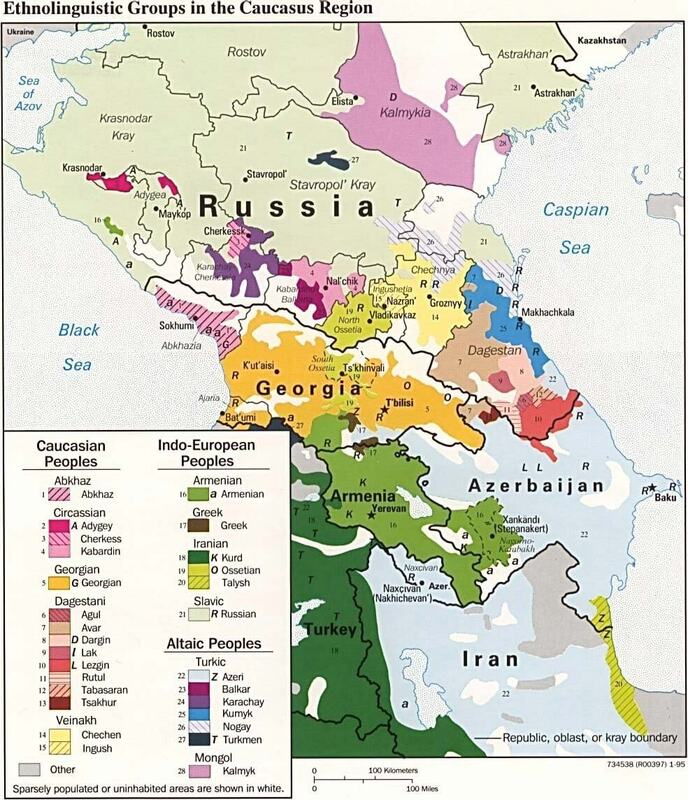 The situation in the Russian Far East and Western Siberia is even worse, with only 31% and 25% of the forest zone remaining intact, respectively. The same pressures also result in the over-harvesting of the more accessible areas. 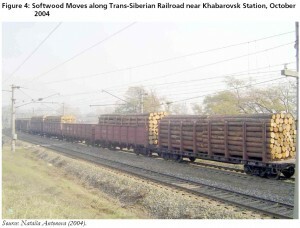 Since transportation costs are extremely high and the infrastructure in the Russian Far East is under-developed (especially, on the east-west axis), both the new focus on the Asian markets and the new sawmills for local timber processing put pressure on logging companies to shift their operations from the north to the south. Trees are now preferentially harvested close to the new processing mills, creating zones of heightened deforestation. Khabarovsk and Primorsky Krais have become the dominant timber centers, accounting for 79% of the Russian Far East production in 2002, up from 48% in 1991 (see chart on the left). Kamchatka once produced 9% of the total, but this figure had shrunk to 1% by 2002. 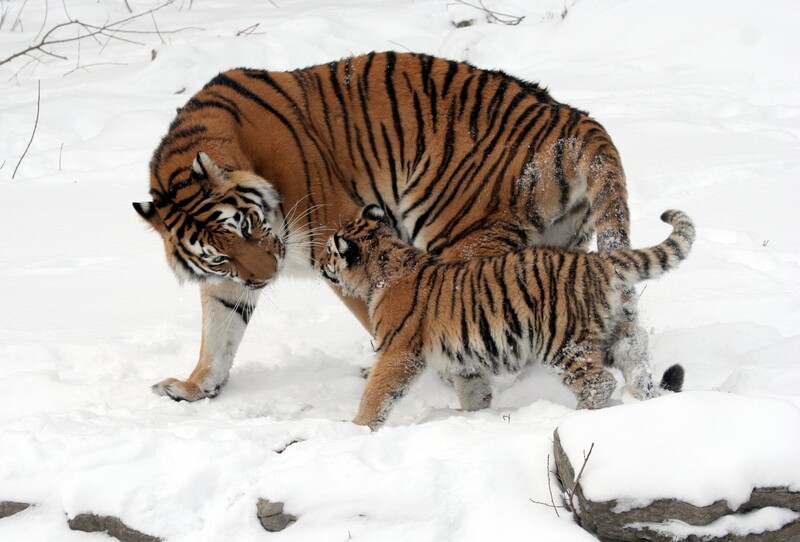 This geographic shift means that logging pressures continue to increase in the Russian Far East’s most biologically diverse forests, including the Ussuri Taiga, home to the magnificent Ussuri (or Siberian) tiger, a severely endangered subspecies. This area is also the site of some of the most controversial logging projects, including Rimbunan Hijau’s Sukpai logging concession and Terneiles’ Samarga concession. These Far Eastern forests are also being destroyed by rampant illegal logging. 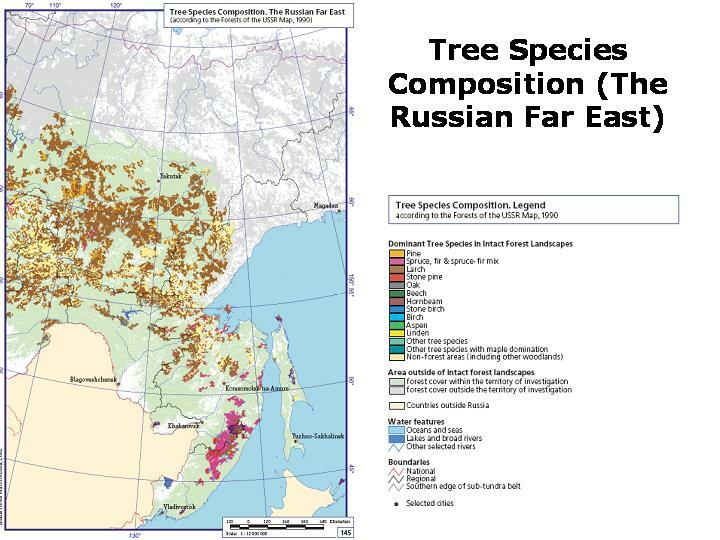 According to the World Wide Fund for Nature (WWF), as much as 50% of total timber harvest in the Primorsky Krai may be illicit; other estimates range from 15% to 70%. Moreover, instances of illegal logging and poorly regulated timber harvest in protected river basins and nature reserves are common. The continued high demand for harvest-restricted Korean pine has led to over-logging, significantly reducing an important food source (pine nuts) for many bird species, including the Spotted Nutcracker. Another array of problems is connected to the construction and operation of the sawmills themselves. Many such mills, especially those that produce pulp, paper and paperboard, plywood, MDF, and millwork (that is, doors, window casing, baseboards, mantels, crown molding, and the like), use glues, bleaches, and other toxic chemicals, which often end up contaminating the soil and the water supply. Environmental safety concerns are often disregarded, even in more dangerous branches of Russia’s industry, as discussed in my earlier post. So is there a silver lining to this cloud? According to some experts, keeping value-added timber processing within Siberia will in the long term bring about much-needed environmental improvements. One positive environmental impact of domestic processing is the diminished need to transport heavy logs across large distances, which significantly reduces the carbon footprint of the forest industry as a whole. But there are also subtler ways in which local processing could improve the ecological situation of the forests in the Russian Far East. To understand those effects we need to consider current harvesting practices. While clearcutting (removing virtually all the standing trees in a selected area) is still very common in Russia, many logging companies now practice selective cutting, harvesting only the best specimens of certain tree species. Such practices are driven by the values of various species and grades of wood on the world market. The bulk of timber exports from the Russian Far East consists of softwood – pine, spruce, fir, and larch – used mainly for structural building components, furniture, and millwork, as well as pulp for paper and paperboard. The value of an individual log depends on its size, variety, and defects it might have. Timber with external defects, determined by inexact external inspection, is not nearly as valuable as better specimens. The best quality log can be priced up to US$5,000-6,000, whereas a lesser specimen would bring merely US$500-1,000. Such differentials provide a clear incentive for loggers to pick only the best trees, which degrades the quality of the forest by effectively conducting negative selection, potentially weakening the gene pool of the tree species. The pressure to select only the best specimens is intensified by the cost considerations. Currently, transportation costs and the “costs of doing business in Russia” are often prohibitively high. In regard to transportation, harvested logs can be shipped by train, truck, or river barge. Barging is not always available, and the Russian truck-accessible road network is meager and in poor condition. 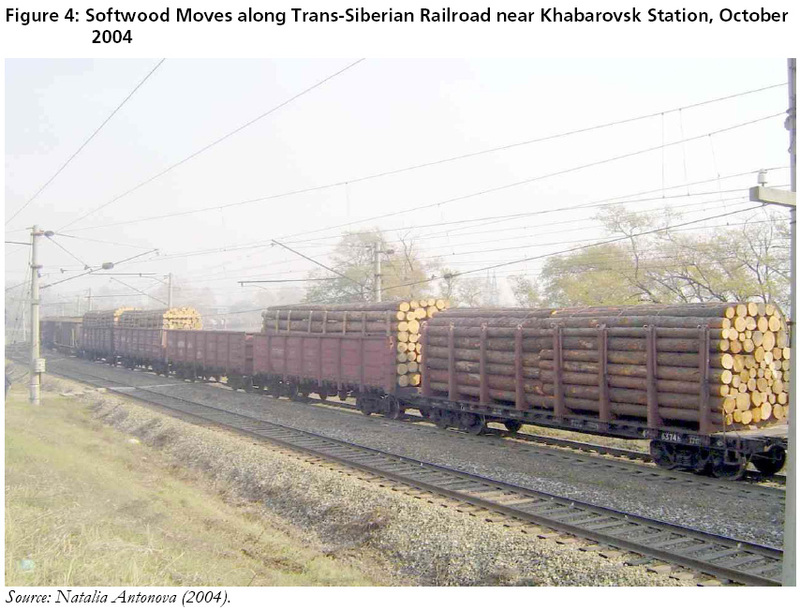 As a result,, rail is the predominant mode of transport, both for harvested wood heading to processing mills and for finished lumber destined for consumer markets. But even the railroad infrastructure is severely underdeveloped, as acknowledged by Vladimir Putin when he chaired a meeting to discuss progress on investment projects in the timber industry in September 2010. Putin vowed to “go slowly and develop the required infrastructure gradually, as the sector grows”, but little progress has been made to date. The often exorbitant “cost of doing business in Russia” is also something that foreign firms need to factor into their cost-benefit calculations. Various dishonest practices, such as deviating from previously agreed upon rates, are quite common. As a result of such disproportionate costs, the only way to profit in the timber business is to cut only large-diameter, commercially valuable trees. Lesser trees are simply not worth the bother. Due to the shortage of timber processing mills, moreover, various byproducts such as woodchips, branches, and smaller logs – used under normal circumstances to make plywood, pulp, and paper – are left at the logging sites, providing fuel for potential fires. While in the short term, selective high-grade logging makes sense from the logging companies’ viewpoint, in the long term it is not a sustainable practice, from either the economic or the environmental point of view. 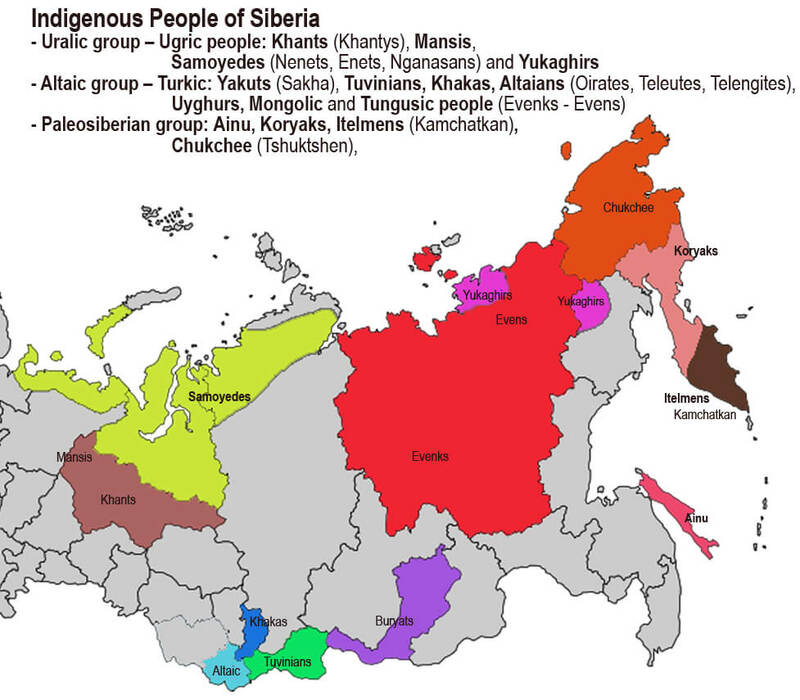 Nor are such practices helping the local indigenous groups of the region, such as Nanai, Udege, Orok, Oroch, Nivkh, Negidal, Ulchi, and Evenk. 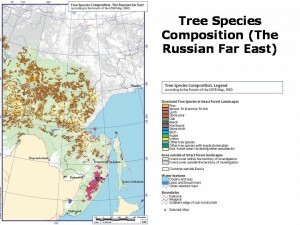 It is hoped that developing a value-added timber processing industry in the Russian Far East will promote the growth of local markets for different species and grades of wood, making lesser trees valuable enough to encourage a more balanced tree-harvesting scheme and improving the overall quality of forest management. Another long-term goal is to encourage Russians “to see the forest for the trees”, that is to attach value to their forests as a whole, beyond the sum total of the prices of individual logs. The forests are – and must be seen as – not just a resource that can be used, exported, and taxed, but also as a provider of numerous ecosystem services: habitat for animals, many of which are endangered species; room for recreational experiences and scientific discovery; and carbon sequestration and climate regulation. Today, few people in Russia value their forests in such a holistic way.